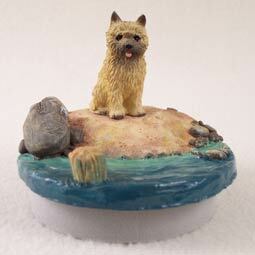 Cairn Terrier Red Candle Topper Tiny One "A Day on the Beach"
Home > Dogs All > Cairn Terrier Red > Cairn Terrier Red Candle Topper Tiny One "A Day on the Beach"
The Cairn Terrier originated in the Highland of Scotland, and the Isle of Skye. In the beginning, this breed was lumped together with the Scottish and West Highland Terriers until the early 1900’s when they began to be bred separately. Best known as TOTO from the Wizard of Oz, this little dog is terrier thru and thru, in fact the name Cairn refers to the rock dens in Scotland where fox, rat, otter or badger lived. These feisty little dogs would wiggle and push themselves right into the rocks and hold the vermin there until the farmer could deal with it. Cairn Terriers live a healthy active life well into their teen years, and can be any color other than white. The AKC recognized the breed in 1913 in the Terrier Group. Ideal size is 10 inches at the withers, with a weight of 14 pounds.